It is always kind of depressing to walk into your friends’ living rooms only to discover the same IKEA ARILD sofa flanked by the same IKEA LACK sofa table standing on the same BASNÄS rug. It would be awesome, if you could design your own furniture. And now you can: SketchChair is an open-source project that allows you to design and build your own furniture. 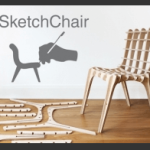 SketchChair is a simpel designed sketching program to build your own furniture. If you dont’s feel creative, the designs are also open-source. You just need to find a manufacturer that will cut out the pieces for you. The pieces are designed to be easily assembled by hand, with no glue required. SketchChair is backed by Kickstarter supporters. It started as a collaboration between the industrial designer Greg Saul and the Japanese JST Erato Igarashi Design UI Project. It is now being developed further by Greg Saul. While it’s not possible to manufacture a working wood model at the NEXT2011 Exhibition, you can come and design your own furniture and get it printed in paper.